Mickey Mouse and Pluto Disney Cuddly Bodysuit for Baby Boy. Mickey Mouse and Pluto applique with embroidered details. Three snap placket at back. 100% organic cotton. Embroidered text. 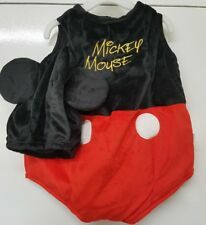 DISNEY STORE MICKEY MOUSE DUNGAREE SHORTS SET FOR BABY NWT 5 POCKETS SUPER CUTE! 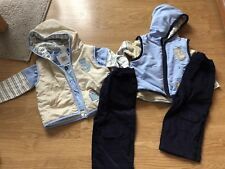 DISNEY STORE MICKEY & DONALD CUTE 2 PC DUNGAREE SET FOR BABY NWT ~ VERY NICE!! Warm, fleecey hoodie and matching sweatpants are decorated with fun Flik appliqués. Embroidered Flik appliqués. Part of ourA Bug's Life Collection for Baby. Jersey knit lined hood. Fuzzy warmwear lining. SIZE: TODDLERS 12 MONTHS. FEATURES: LONG CUFFED KNIT PANTS, WAFFLE FRONT SS TEE. All pictures and information taken directly from item. FEATURES: CUFFED KNIT PANTS, WAFFLE FRONT SS TEE WITH MICKEY FACES FRONT & BACK. SIZE: TODDLERS 18 MONTHS. L@@K AT WHAT I HAVE FOR YOU.